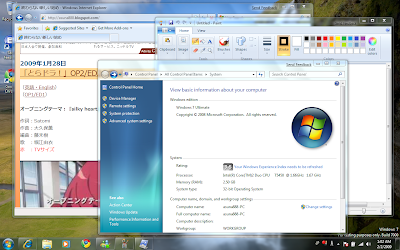 Earlier yesterday (Sunday), I had downloaded the beta version of Windows 7. Downloads can only be done up to February 10, 2009, incomplete downloads on that day will have an additional 2 days to complete. Due to the nature of installation, the download file was a DVD iso image (~2GB) and had to be restarted several times. Knowing that this would work until August 1st, 2009, it would be best to install it on a different partion, as a virtual OS, or another PC that you don't mind formatting over. The requirements are a 1Ghz processor, 1GB of RAM, 16GB of free space, and whatever graphic requirements. It was so good that, apart from some bugs, that it does seem ready to be released as the RTM version. There wasn't any major problems with the hardware or software I tested. Partitioning wasn't really an issue as there were already 2 equal partions on the laptop drive between Windows Vista (C: Drive) and another without an OS on it (D: Drive). I just need to backup the files on the C: drive and move existing files on the D: drive onto one of the 3 portable hard disk drives I have. By backing up, I mean copying personal files to a different physical drive and not using the program that came with the operating system (or any 3rd party software), mainly because it is more troublesome to recover and, in some circumstances, may not work. Installation, compared to earlier versions, was quite fast. Except for prompts asking me to restart, and selecting between the Windows 7 Setup and Windows Vista afterwards (this appears if the PC has 2 or more OSes on it), the begining (downloading of updates, upgrade or custom install), and the end (serial key), they never ask me for anything. One of the first things I did was to check how different things are from Windows Vista Home Basic (and earlier) first hand. I know I have read a lot of reviews, most of it positive, but it would be better if I would experience it first-hand. I know Aero came with Windows Vista, but the one I had is a Home Basic version, and there isn't any, or the very least, a pseudo version. And the only other operating I have use in recent years are Ubuntu Linux, Windows XP, and a tiny bit of Mac OS 9/X. So, the first time I experience it first-hand and using it as I like, I actually liked it. 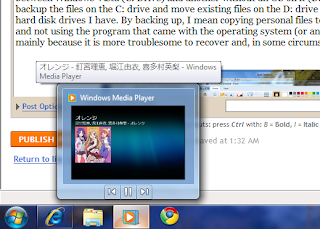 The taskbar is different, if you hover over the Windows Media icon in the taskbar, you can control the song from that pops up with the control buttons. For the IE8 (beta) icon, hovering over it would show all the tabs that are open in it. I tried with Crome earlier (at least, the version as as the time of this post), but that don't seem to work unless all the tabs are separated. 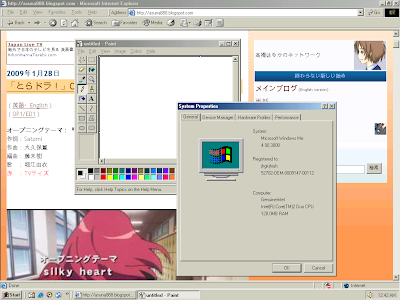 This is a major overhall since the earlier version was introduced in Windows 95. The background can be set to change from every 10 seconds to 1 day. Of course, the order can be shuffled. Also, when setting the wallpaper, there is also the option to fill and fit, on top of the existing center, tile, and stretch options. Movie Maker is missing, but is included in the version of Windows Live Essentials suite that was released last month (January). 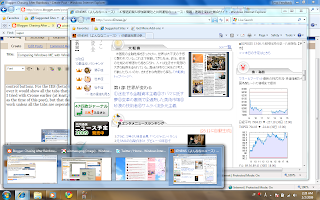 However, at the current state, the features are somewhat limited as compared to the one that came with Vista. 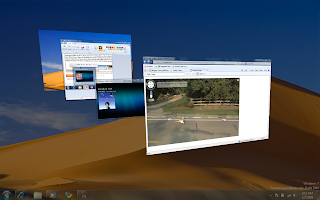 As a comparisian of how far Windows 7 has come, I have opened smillar things to Windows ME (which came out 10 years ago) and you can see how different it is. Both screenshots were taken on the same day.